November 15, 2017 Pornchanok Iamsirirak, M.D. Professor Suradej Hongeng, M.D. My daughter, Tonkhao, had suffered from Thalassemia Hemoglobin E since birth, meaning that her health had never been strong and she was always getting sick. At five years old, it was clear that her bones were not growing at the expected rate for a child of her age and she looked rather small. It was therefore decided that she would begin receiving blood transfusions to sustain her growth. She received her first transfusion in March 2013, after which, transfusions of between half a bag and two bags continued on a monthly basis. All of Tonkhao’s family had their hearts set on having her cured of this illness as she is an only child with no siblings. In our search, we contacted the Thai Red Cross Society in order to find a suitable Stem Cell Donor. Unfortunately, no donors were found with HLA tissue that was 100% suitable for Tonkhao. In early 2015, however, there was a breakthrough as we found out about a new evolution in treatment, whereby the stem cells of parents could be used to treat their child. Although neither my HLA tissue or that of her father was a 100% match with Tonkhao’s, this news was still seen as positive and gave the whole family new hope. We were given a detailed explanation of the steps involved in the treatment process by Dr. Suradej Hongeng and received encouragement from the entire medical team at Samitivej Hospital. Our family, therefore, decided to go ahead with this treatment immediately. Tonkhao began treatment in March 2015, starting with ten rounds of chemotherapy between March and April. She was admitted to Samitivej Srinakarin Hospital from 25th May 2015 to 28th June 2015 to undergo bone marrow transplantation from my stem cells. 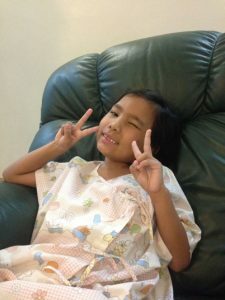 From the time that Tonkhao was admitted, we witnessed the dedication and hard work that went into her care from the team of medical professionals at the hospital. Every stage was carefully planned out including a detailed explanation of each step which was passed on to us in regular discussions. We really appreciated the medical team’s highly professional approach to keeping our family informed. We were also impressed by the treatment rooms, which were modern, comfortable and spacious enough for both our family and Tonkhao to relax in. After receiving the bone marrow transplant, Tonkhao returned home to recover for a year until she could start to lead a normal life again. Currently, Tonkhao is fit and healthy. She doesn’t get sick anymore and is developing physically at a standard rate. Also, she no longer needs blood transfusions.